Coconut, passion fruit, almonds, pistachios, pumpkin and sunflower seeds, flax seed, hazelnuts. Lizi's breakfast cereals with nuts and maracuums have a low glycemic load GL 7 - unlike ordinary flakes after eating Lizi's for breakfast, the feeling of fullness will accompany you until lunch and you will not be tempted by anything fancy! If you happen to eat cereal for breakfast with milk or yogurt and already on the way to work, say that you want a bun, and during the day you can not wait for another meal without reaching for a snack - Lizi's is just for you! 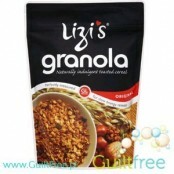 Lizi's oat granola is a fantastic blend of wholesome ingredients - coconut, pieces of apple, passion fruit puree, almonds, hazelnuts, walnuts, cashew nuts, pumpkin and sunflower seeds, and linseed. All these ingredients combine the aroat of cinnamon and rosemary. The addition of oligofructose - a natural fiber obtained from chicory and prebiotic helps to protect the health of the digestive tract. In comparison to other nut granola available on the market *, Lizi's Original granola has 20% less carbohydrates, almost twice as less sugar, 50% more fiber and 7 (!) Times less sodium! Lizi's oat granola with pistachios and martyrs is roasted whole-grain oatmeal with a very low GL 7 glycemic load per serving - therefore, unlike ordinary breakfast cereals after eating Lizi's for breakfast, the feeling of fullness will accompany you until lunch and you will not get fit fancy something sweet! The glycemic index (IG) describes the properties (rate of absorption) of carbohydrates in the products we consume, but does not take into account the amount of carbohydrates consumed in a given meal. In order to determine what effect the consumption of a specific amount of carbohydrates has on the blood sugar level, one should use the second parameter, i.e. the glycemic load. GL (glycemic load) expresses the number of insulin released into the blood after eating a given meal. Glycemic loadings of the ingredients of a meal, as well as all meals during the day can be added up. It has been proven that meals with less than 20g GL (and therefore increasing insulin levels by as much as 20g of pure glucose) have little effect on the level of blood sugar. 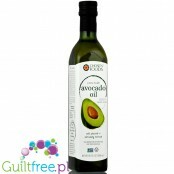 It is optimal to eat 3 meals a day with a GL of no more than 20 and two snacks with a GL of no more than 10. Taking into account GL you do not have to completely give up carbohydrates, it is much easier to choose the 'good' ones that give you a feeling of being full longer - these carbohydrates are found in Lizi's granola with a glycemic load of 7.0 - even a few times lower than regular breakfast cereals overloaded with simple carbohydrates of the same basis weight. 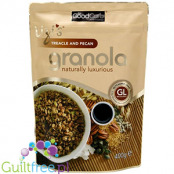 Forget about snacking and incorporate Lizi's granola into your breakfasts! Delicious full-roasted oatmeal will not only delight you with its taste, but also guarantee you a feeling of fullness for hours. 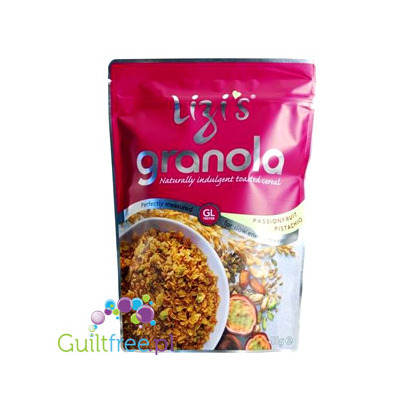 The low-carbohydrate food product Granola Lizi's is not a medicinal product and in the case of people suffering from metabolic diseases can be consumed only after consultation with a diabetologist. Ingredients: jumbo unprocessed oats, rapeseed oil, desiccated coconut (maximum dried and free of any water from the mass), fructose, oligofructose syrup (natural fiber obtained from chicory), apple juice concentrate, Black Treacle (molasses), pistachio nut halves ( 3%), cashew nuts, almond flakes, hazelnut pieces, maracuja passion (1%), pumpkin seeds, sunflower seeds, linseed, natural aroma. 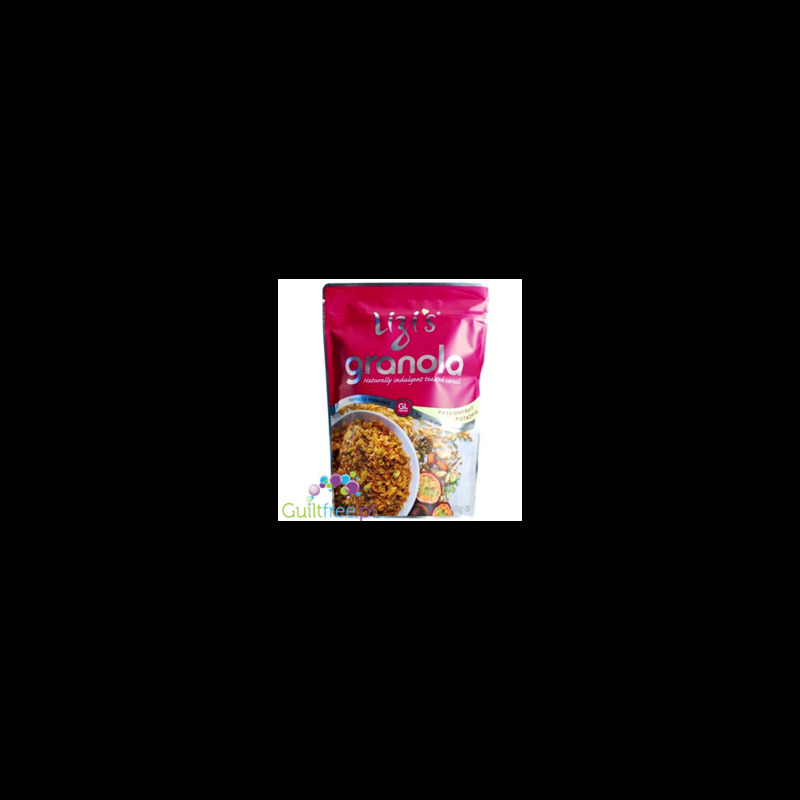 Allergens: The product contains wood nuts and oats. Produced in a processing plant for sesame and peanuts. 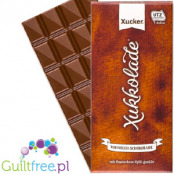 The product does not contain wheat, but the oats used in it may contain traces of wheat and therefore we can not guarantee that the product is gluten-free. Nutritional values ​​per 100g: 488kcal, 9.3g of protein, 53.1g of carbohydrates (including 16.1g of sugar), 24.7g of fat, 13.5g of fiber, 0.011 sodium, glycemic load 14g. 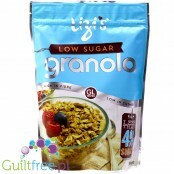 Crunchy breakfast cereals without sugar, high fiber content and low glycemic load.Lizi's Low Sugar is coconut, hazelnuts, walnuts and cashews, pumpkin and sunflower seeds and linseed mixed with very crunchy oatmealExcellent, filling milk, yoghurt or fruit. 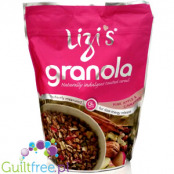 Gluten-free crunchy breakfast cereals with no added sugar, high fiber content and low glycemic load.Lizi's Gluten Free is a gluten-free version of Original Granola - it's coconut, hazelnuts, Italian and cashews, pumpkin and sunflower seeds and linseed mixed with very crunchy oatmeal. 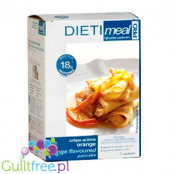 Excellent, filling milk, yoghurt or fruit supplement. 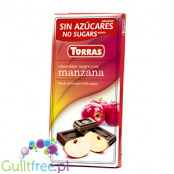 Dark chocolate with pieces of dried apples, sweetened with maltitol has 15% less calories than regular dark chocolate and much less carbohydrates and tastes just as delicious. Contains as much as 10g of fiber and the whole plate has only 1.5g of sugar! 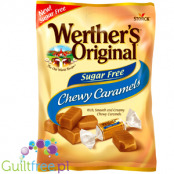 Soft caramels chewing Werther's Original (sugar-free) melt in your mouth and are based on the same recipe as high-calorie candies - their delicious taste comes from real butter and creamy cream.Sweet, soft candies do not contain sugar and have 30% less calories than the usual 'Werthersy' - enjoy yourself and enjoy the taste of the most delicious sweets. New formula! Bolero with stew, no artificial coloring, flavors and preservatives, enriched with vitamin C. Sachet to be mixed with 1.5L of water. 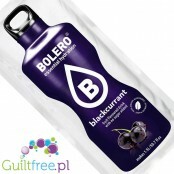 Sweetened with stevia refreshing drink flavored blackcurrant contains no sugar and has only 1kcal. 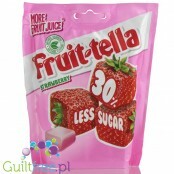 Aromatic, sweet, intense fruit chewing gum with fruit juice does not contain any sugar and is gluten free! 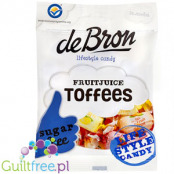 Low calorie, healthier version of popular soluble gum types Mamba or Fruitella.You want to limit sugar, and you lack sweets, you eliminate gluten - go for DeBron candy!